A psychotic depression refers to a major depressive episode that is accompanied by one or more psychotic features. The psychotic features could be hallucinations (hearing voices, seeing or smelling things), delusions (being convinced that you are a failure, worthless or guilty of something, despite superior evidence to the contrary). Half of these people experience more than one delusion. People with psychotic depression usually have depression related delusions or hallucinations. They often think that others can hear their thoughts, or that their thoughts are actually someone else’s thoughts. Despite the fact that most of them know that their thoughts are not true, they may be embarrassed and try to hide them. Psychotic depression can occur in the context of major depressive disorder or bipolar disorder and is difficult to diagnose, because many symptoms related to psychotic depression are also related to schizo-affective disorder or other depression types. Therefore it is wise to make an appointment with a psychiatrist if you think you might have psychotic depression. At Barends Psychology Practice, online counseling is offered for many types of depression. changes in appetite (weight gain or loss). changes in sleeping (oversleeping or having problems falling asleep). less joy in activities you used to like. Hallucinations: seeing, hearing or smelling things that are not real. You might hear voices telling you what to do or telling you that you are worthless. Or you might smell chemicals that no-one else smells and be convinced that people are trying to harm you. Or perhaps you see a friend sitting next to you while in fact you are alone in the room. Delusions: having irrational thoughts and fears. You might be convinced that aliens are coming for you, that your phone is tapped, or it may be the case that you are convinced you committed a murder, while in fact none of this actually happened or happens. Note: it is possible for someone to experience positive delusions/hallucinations. In these cases people may have a feeling that everybody is in love with them or likes them. They may be convinced they are secretly being visited by celebrities or that they invented certain things. At the moment it is unclear what exactly causes psychotic depression, but people are more at risk of developing it if they have a first degree family member (biological parent or sibling) who experienced depression. Psychotic symptoms tend to develop after having experienced several depressive episodes without psychosis. 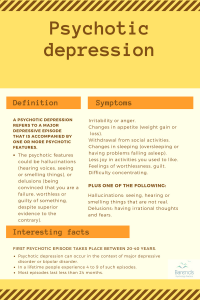 Once someone experienced this type of depression, the psychotic symptoms tend to return with each depressive episode. An episode of psychotic depression is usually experienced between the ages 20-40. In a lifetime people experience 4 to 9 of such episodes. Most episodes last less than 24 months. Little research has been conducted to the effects of PTSD treatment in people with psychotic depression, because there is an unfounded fear that PTSD treatment may increase the amount and severity of psychotic episodes. Van der Gaag conducted a pilotstudy to the effects of EMDR (PTSD treatment) on psychotic episodes in people diagnosed with Schizophrenic disorder. The results show a significant reduction of the amount of psychotic episodes and a significant reduction on the intensity of each psychotic episode. The results from this study are very promising! Usually a combination of anti-psychotic medication and antidepressants are used to treat psychotic depression. Another treatment method is electro-convulsive therapy (ECT). However, electro-convulsive therapy is very controversial, because it can be very painful (some people experience it as torture). Both medications and ECT focus solely on reducing the symptoms, instead of treating the root of the problem.